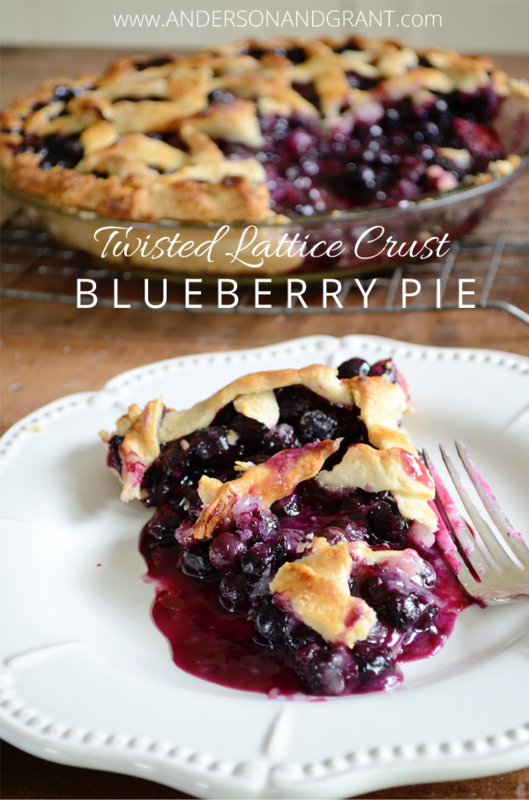 With just three ingredients, this Blueberry Pie has the most incredible flavor and the special twisted lattice crust on top makes it anything but ordinary. It is the perfect dessert to serve in the summer using fresh fruit. When I think of the Fourth of July, I think of blueberries. I don't know why.....maybe it is because it is a summer fruit for a summer holiday. Maybe it is because they are blue and if your throw in some raspberries you are on your way to a red, white, and blue theme. 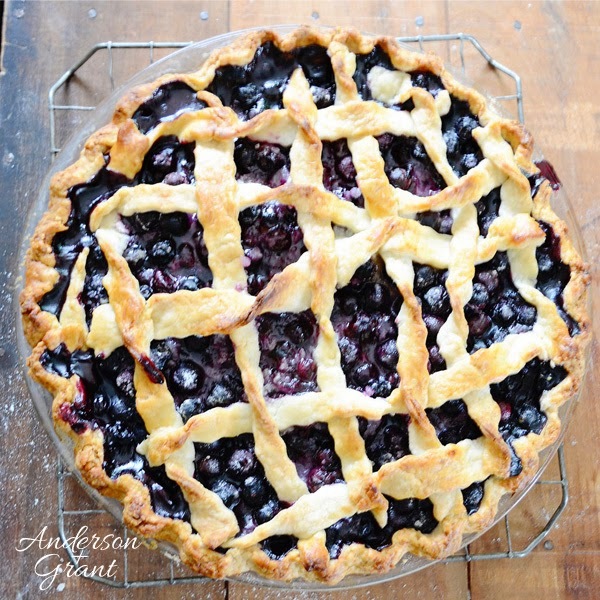 Whatever the reason, I felt like today is the perfect day for sharing a recipe for a delicious blueberry pie. It is so incredibly easy to make. Plus, it has a really interesting twisted lattice crust. As a girl who thinks the presentation of food is even more important than taste, I believe that detail puts this pie over the top of being perfect. The recipe is from Martha Stewart and aired on her show back in 1994....did you know that you are still able to watch these videos from her website? Being the huge Martha fan that I am, I've become a little obsessed with watching them....But, that's a whole other story for another day! 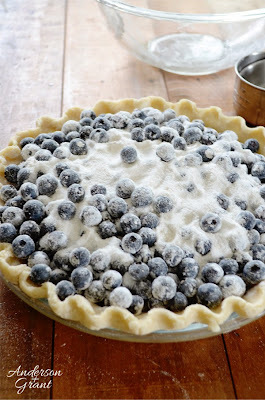 The pie really only has three ingredients: blueberries, sugar, and a little flour to thicken the fruit juices. It is unbelievable how sweet the pie could be just with the fresh summer berries and sugar. I posted the recipe for the crust yesterday, in case you missed it. I've tried other recipes for crust in the past, but have had various problems with getting it perfect. I think this one might be the best I've found yet, so I want to make sure that I can refer to it again if I need to for another pie. I even had enough crust left over from this pie to make another one crust pie easily. You may have your own perfect crust recipe, though, you are welcome to stick with that! 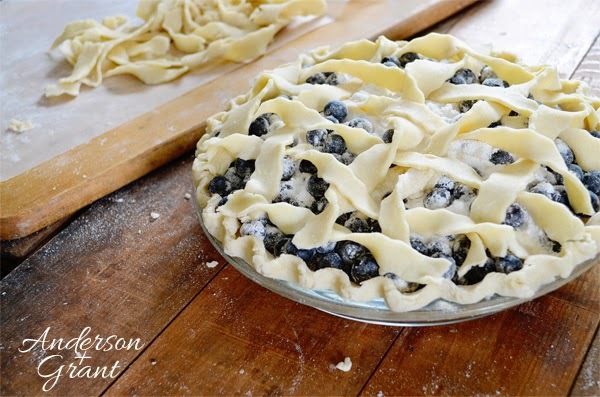 Either way, this pie comes together quickly and easily if you are able to make the crust a day ahead. 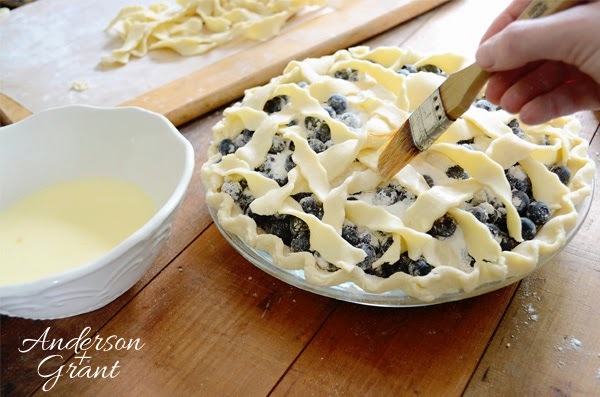 Mix your pie crust and roll out the bottom crust. Lightly butter the pie plate you'll be using. This prevents the fruit juices from seeping out of your pie. 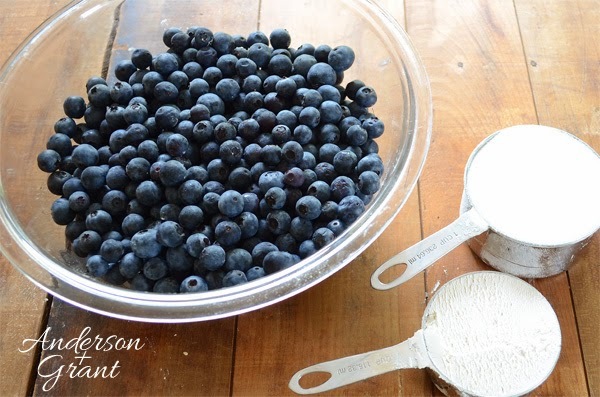 Stir the blueberries, sugar, and flour together in a bowl. Pour the ingredients into the pie shell you've made making sure that the flour and sugar is distributed throughout the pie. Add the chunks of butter in different places over the ingredients. This will bring out the flavor of the fruit juices. 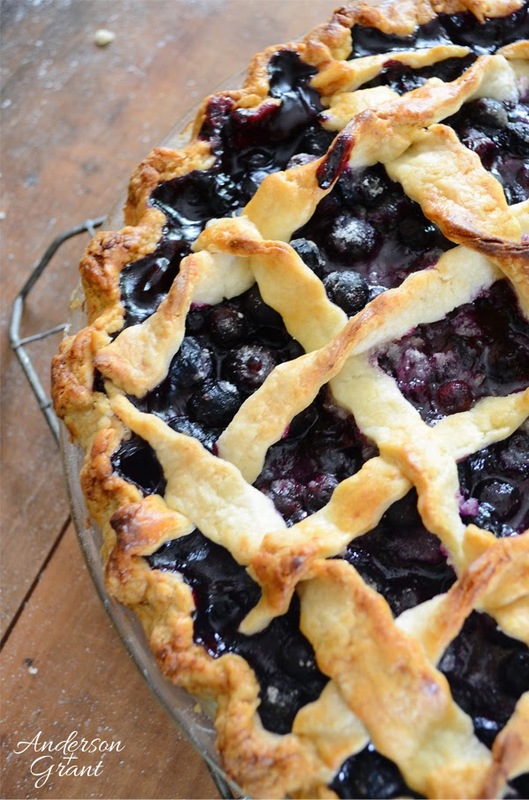 Now you need to prepare your lattice crust top. Roll out your second round of pastry evenly to about an 1/8 inch thickness. 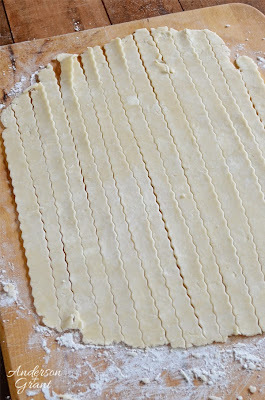 Use a pastry wheel to cut long strips of dough about 1/2 inch thick. This can also be done with a knife. Chill the strips on a waxed paper lined cookie sheet in the refrigerator until they are firm. Remove the strips from the refrigerator and twist each one gently. Place back on the lined cookie sheet and press the ends of each twist down on the cookie sheet to ensure that it doesn't unroll. Put the cookie sheet back into the refrigerator to firm them up again. When the strips are ready to use, lay out enough on top of the pie to go in one direction. Then take addition strips and weave in the opposite direction. This will be the hardest part of this recipe! When you have the lattice woven together, straighten out your weaving, snip the ends of the pie crust, and press the ends into the ruffled edge. Mix a glaze of one egg that has been beaten into 1/2 cup of milk and brush it over the entire crust. This will help your crust to turn a beautiful golden brown color. Bake the pie at 425 degrees for 20 minutes and then turn the oven down to 400 degrees for an additional 30 to 40 minutes. The pie is done when the juices in the center are bubbling. If the edges of your crust are getting too brown, you can cover them with foil or a pie crust shield. Cool for at least 30 minutes before serving to allow the pie to set. And there you have it! 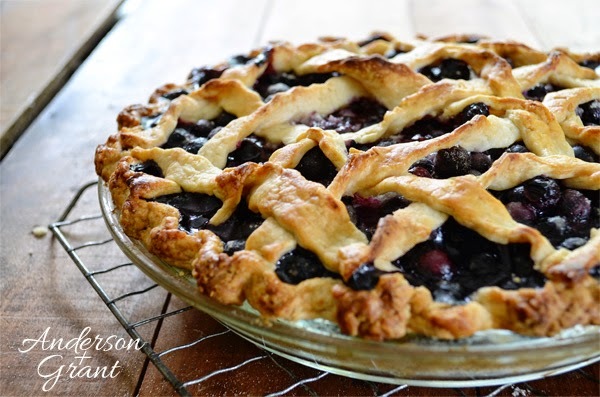 Add a scoop of vanilla ice cream and you have a fantastic berry pie perfect for a warm summer day. Enjoy!